Post #100 at Bewitching Kitchen! Pop the Champagne and toast to food! It’s hard to believe that only NINE breads remain in the BBA Challenge… If you haven’t been following it, Nicole launched the event months ago with the idea of baking her way through the Bread Baker’s Apprentice, by Peter Reinhart, and invited other crazy bakers to join in. We bake’em and blog’em, but if you want the recipes, then you’ll have to get the book. 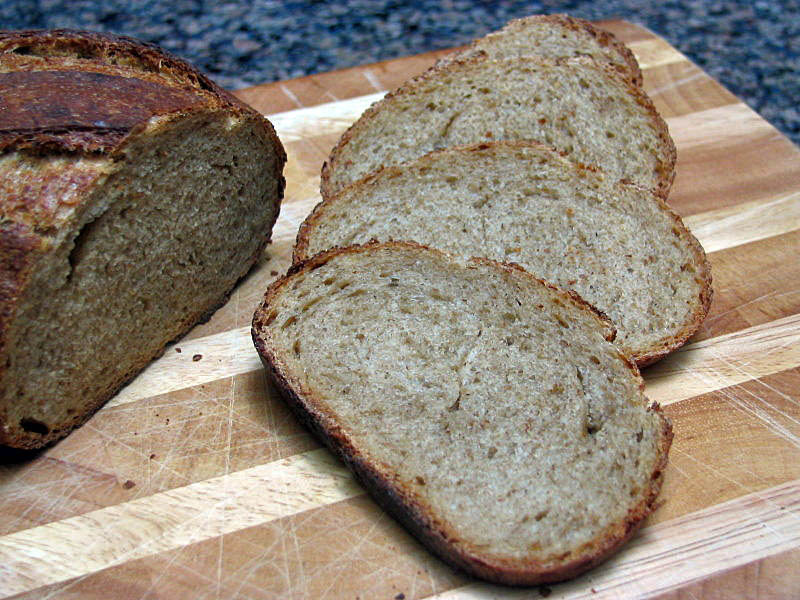 I am glad to report that this bread was a winner, even without the correct flour! I halved the recipe, mainly because I didn’t expect us to love it, but, in retrospect, that was a mistake: two of these loaves would be more than welcome in our home! I had no problems whatsoever with this recipe. 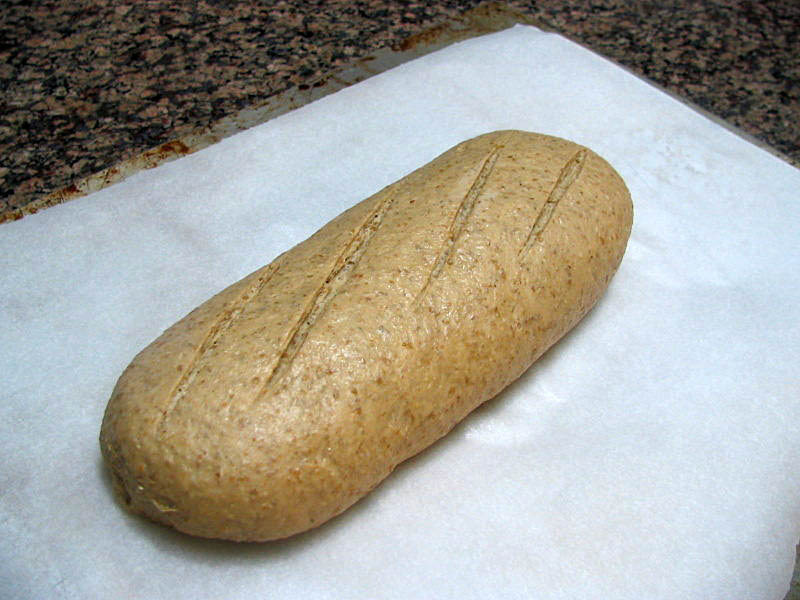 I skipped pictures of the dough rising, because it didn’t seem to rise much, but this photo shows the slashed loaf, just before the oven. Congrats on post #100! The bread looks great. Wow, 100 blogs. Impressive. The slashing on your loaves is perfection. You’re really moving along. I’m stuck at Portugeese Sweet Bread, trying to muster up some enthusiasm for that! But seeing your lovely Pumpernickle may be just the push I need. I absolutely LOVED the Portuguese Sweet Bread! Great job with the pumpernickel Sally! I’m just getting ready to start the sourdoughs next week. Can’t wait! MY kind of bread, Sally. Good job. I may have to try it myself one day. Cindy, it’s not easy to keep the challenge during the holidays, but I was lucky to get to the sourdoughs right then, since they are my favorite kind of bread. Congratulations on your 100th post. I am afraid to move past the 100% sourdough rye! Very nice oven spring. The slashes filled out beautifully and the loaf looks amazing! I’m only now starting on the sourdough- I’ve had to wake my starters after a three week hiatus. 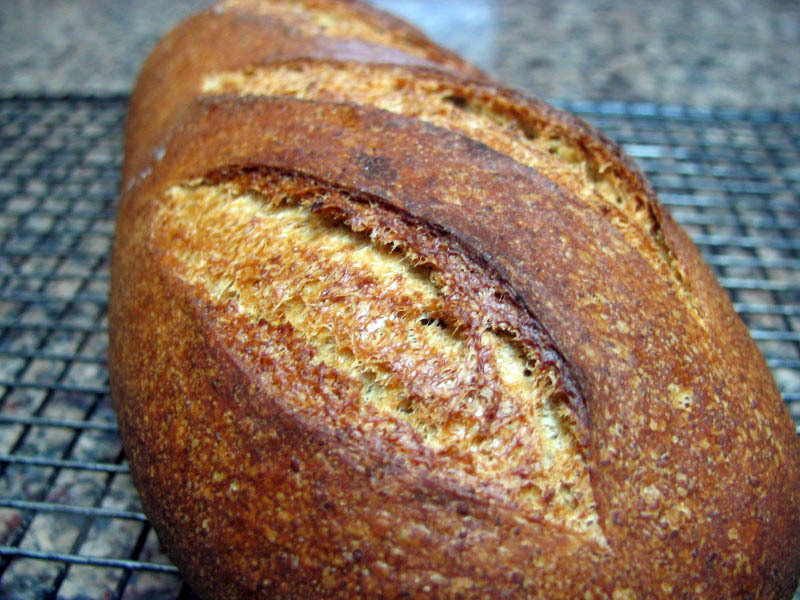 Good luck with your sourdough series… such a fun collection of breads ahead, isn´t it? Just getting started on this one, the “firm rye starter” is doing it’s 4 hour thing as I write. May get the dough mixed tonight. 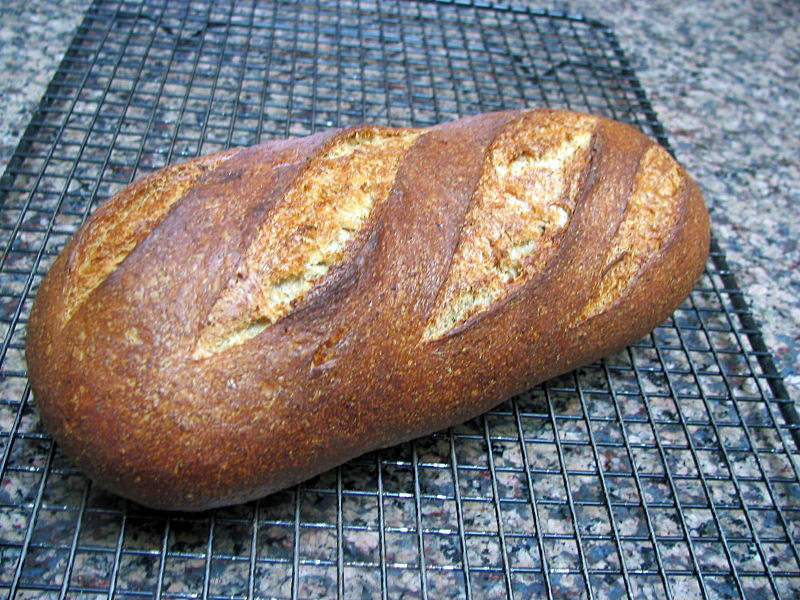 I too don’t have pumpernickel flour so the dark rye will (again) have to substitute. I think I’ll put mine in pans, just for the heck of it. If they tun out as nice as yours seemed to, I’ll be happy. Glad you liked the results!